According to LNS Research data, the Industrial Internet of Things (IIoT) seems poised to gain widespread adoption soon, as 37% of 685 respondants expcet to invest in IIoT in the next 12 months. This is more than three times larger than the total population of companies that previously invested! While exciting, this means that a large portion of the market will be deploying IIoT with no or limited experience, and the second largest challenge to addressing industry trends is Leveraging and Deploying Technology (cited by 70% of respondants).And 23% of respondents were deploying IIoT to address quality improvement use cases. And 23% of respondents were deploying IIoT to address quality improvement use cases. So, how does an organization successfully deploy IIoT to achieve quality improvement? First, we need to define success, which is meeting time, volume, and quality targets. Then we need to understand common roadblocks. In an earlier post, we discussed common IIoT deployment issues: overwhelming stakeholders with un-actionable information, insufficient security, missing stated targets, and lack of organizational preparedness. Finally, we need to use this information to achieve success. In this post we’ll review fundamental strategies to help achieve a successful quality improvement IIoT deployment. Narrow down focus to only the most important goals aligned with best business opportunities. Carefully select and verify metrics that define project success, using previous similar projects and credible third party data. This is a critical and often difficult step. Set targets for conservative as well as best case scenarios. Get buy-in from extended teams including sponsors and influencers. Quality systems business cases can be surprisingly difficult to justify - picking the right metrics and then measuring them can be a real challenge. Every system wants to claim credit when Cost of Poor Quality (CoPQ) decreases! But, CoPQ can be too big, and impact on this metric can be hard to trace. Often, while quality projects can and should claim impact on CoPQ, they should also justify with a more directly measurable metric. IIoT has a huge impact here! Just make sure that the metrics selected above are directly measurable and directly attributable to performance of the IIoT system, and ensure that the IIoT platform is able to provide data that directly traces to the quality improvement. For instance, one leading manufacturer is leveraging IIoT in its manufacturing operations to reduce customer receipt of DOA (Dead on Arrival) products. The manufacturer plans to deploy 100% inline testing in order to provide more complete functional testing and earlier detection of defective modules. While the system will directly measure inline testing, it will be able to show this data against DOA Customer Complaints. Both sets of data trace to CoPQ. IIoT can create new opportunities and disruption, but “new” and “disruptive” spell “unknown.” Expect an unplanned requirement, Equipment behavior, customer reaction, etc., which create opportunities that open new markets and add unexpected competitive value. Agility is the mantra of the day. Here are two elements to get right lean change management connected with quality and development, and IIoT system flexibility. It’s possible that the biggest IIoT risk is a security breach, or a public consumer backlash against perceived privacy breaches. This US Federal Trade Commission Report captures likely areas to guard against, including “security by design”, minimizing data collection and retention, adequate testing, increasing personnel’s security focus, service provider security, etc. Whether developing a system or choosing a vendor, this is one area that cannot be compromised. In order to maximize value of IIoT investments, affected groups such as sales, marketing, service and quality must be fully engaged and prepared for the organizational impact of IIoT. These groups must be involved in planning and executing, be provided with necessary technology, and have the appropriate training, processes, and KPIs in place to ensure project success. Refer to the LNS Research’s Digitalization and Industrial Transformation Framework for guidance in Figure 1. 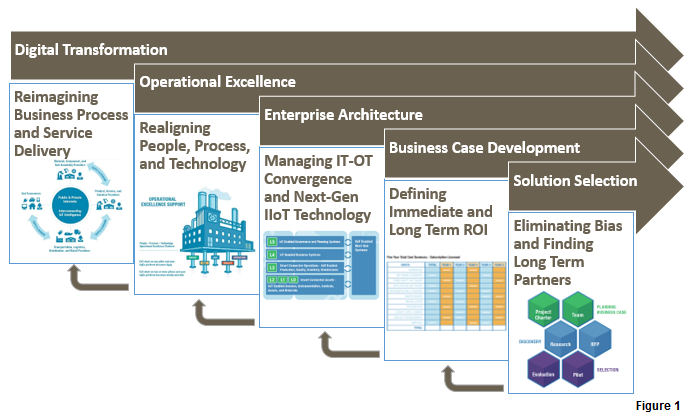 This transformation framework starts with digital transformation, which informs updates to the operational excellence model, in turn guiding changes to enterprise architecture (EA), leading to business case development and finally solution selection. Risk management must also be employed throughout the process. Approaches like Toyota’s DRBFM (Design Review By Failure Mode) might be most appropriate here, as DRBFM engages cross-functional teams to identify and mitigate risks brought about by new products or processes (or technology). IIoT opens the door to a better informed world with new operating paradigms. LNS Research believes that it will be a transformative force for the foreseeable future. A new and much larger wave of companies expect to deploy this technology soon, likely with mixed results. The 6 strategies outlined here will increase the probability of success, and we’ll continue to provide additional research and insight into achieving success with IIoT as well as other developments in IIoT and operational excellence.